We are a community theatre company located in the East Cost Bays of Auckland, New Zealand. 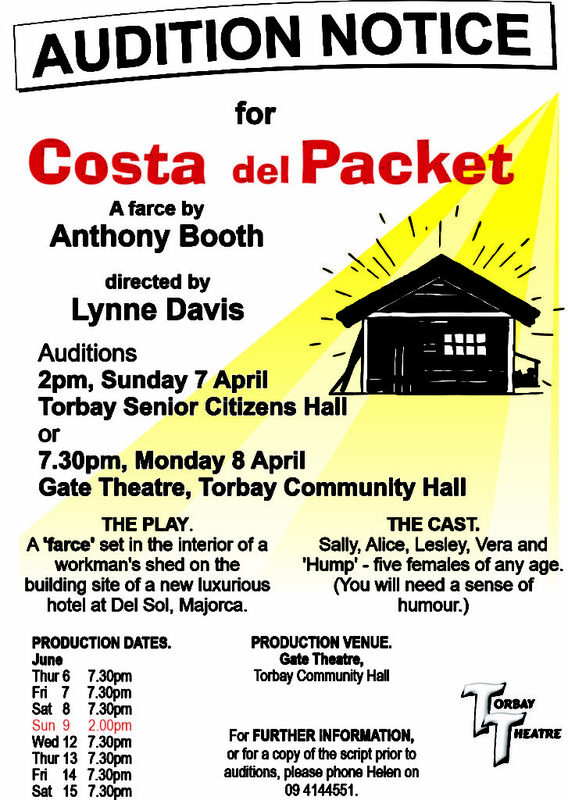 We are auditioning for the second half of our June double-bill – Costa del Packet by Anthony Booth, directed by Lynne Davis. Four women arrive at Costa del Sol on a package tour. They find themselves stranded in a workman’s hut on the site of their hotel, which is not even constructed yet. Determined not to let their husbands know that they have been conned, they decide not to return home and determinedly try to make the best of everything. It is, however, far from easy! 5 females of any age; Sally, Alice, Lesley, Vera and ‘Hump’. You will need a sense of humour. We are also looking for a male actor for the first half of this double-bill. For more information, click here. We also have three or four “Club Nights” each year. These are evenings when members are encouraged to perform a song or skit or short play scene for the entertainment of their fellow members in a friendly and supportive environment. These are generally very well received and a lot of fun is enjoyed by both performers and audience. The best way to stay informed about these activities is to join our theatre, by clicking here.